2018 was not a great year for tech and 2019 promises to be no better. Even Amazon, the most respected tech brand, is facing scrutiny - and Jeff Bezos has warned that the company may cease to exist some day. It used to be that only a few cranks criticized Amazon, but that is shifting. Amazon makes (third party sellers) sign a most-favored-nation or M.F.N. clause, which stipulates they cannot sell on another site cheaper than they sell on Amazon. 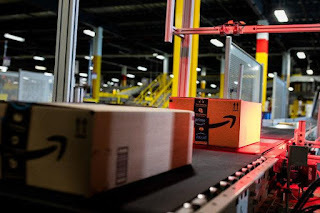 (But) Senator Richard Blumenthal wrote to the Federal Trade Commission and the Justice Department, “deeply concerned” that Amazon’s contracts could stifle competition and inflate prices. (And) warehouse employees are calling for unionization. Amazon has stymied unionization, so this is momentous. Hi, I’m David Streitfeld, reporting from a very quiet week in Silicon Valley. The venture capitalists were at their vacation homes or exotic resorts, dreaming of riches to come. Entrepreneurs also must have taken time off, because I made it to San Jose in less than two hours, a personal record. There wasn’t even a new data privacy scandal to occupy the pundits. Amazon, however, never lets up. Chances are, something under your family Christmas tree or at your Hanukkah or Kwanzaa celebration was from the retailer. Perhaps everything was. Amazon’s 210th and final press release of the year summarized the company’s holiday season: best ever. If history is any guide, more than half those sales were made by third parties — shops big and small that are in essence renting a stall in the Amazon bazaar. With millions of marketplace sellers battling for a piece of the lucrative Amazon action, competition is fierce. Exactly how tough I didn’t realize until I read a piece called “Prime and Punishment: Dirty Dealing in the $175 Billion Amazon Marketplace,” by Josh Dzieza on the tech site the Verge. Almost as an aside, the article mentions that some unscrupulous sellers were taking an established competitor’s product, setting it on fire and then posting photos saying it exploded. Amazon would go nuts and pull the product as a safety hazard, leaving a clear field for the shady new arrival. At Amazon, the customer reigns supreme, which means sellers who are accused of doing something wrong need to confess to something, anything, even if they are the victim of another seller’s sabotage. It’s so difficult to mount a successful appeal that many merchants hire professional advisers to get them out of Amazon jail. Amazon also turns up in a new story in Wired, which asks: Whatever happened to the Future Book? That is the writer Craig Mod’s term for the immersive, interactive, highly connected thrill ride that would finally kill off the traditional boring physical book by, oh, 2015. It didn’t happen. “My Kindle Oasis — one of the most svelte, elegant and expensive digital book containers you can buy in 2018 — is about as interactive as a potato,” Mr. Mod writes. One possible reason: Amazon had little competition for the Kindle, so innovation in e-readers ground to a halt. Both the Wired and the Verge stories might seem to be about how Amazon is overextended, can’t be all things to all people and needs to do what it already does better rather than keep expanding into new fields. But they’re really about how Amazon wins even when it loses. Mr. Mod’s point is that while Kindles never killed physical books, there has nevertheless been an explosion of activity around the book. For instance, it is much simpler and much cheaper to publish yourself than it was 20 years ago. There has also been an explosion in recorded books that will only grow as smart speakers in the home become ubiquitous. And who owns the leading home speaker company, the leading recorded books company and the biggest — by far — physical and digital bookstore? You guessed it. As for the Amazon Marketplace sellers who are undermined by bad guys, Amazon has an answer: protection, for a price. A wrinkle about the third-party sellers that the Verge doesn’t tackle is the way Amazon makes them sign what is called a most-favored-nation or M.F.N. clause, which stipulates they cannot sell on another site cheaper than they sell on Amazon. British and German regulators investigated the retailer’s use of these clauses a few years ago, with the result that Amazon dropped the practice in Europe. But they’re still in use in the United States. In May, two law professors detailed the case against the M.F.N. restrictions as harmful to consumers in a Yale Law Journal article, “Antitrust Enforcement Against Platform MFNs.” A few days before Christmas, Senator Richard Blumenthal of Connecticut picked up on the issue and wrote a four-page letter to the Federal Trade Commission and the Justice Department saying he was “deeply concerned” that Amazon’s M.F.N. contracts could stifle market competition and artificially inflate prices. For instance, Mr. Blumenthal wrote, a competitor to Amazon might try to gain an edge by charging merchants a smaller commission. If those merchants also sell on Amazon, however, they could not pass along those savings to their customers, because of the M.F.N. clause. That would be bad for consumers while reinforcing Amazon’s dominance. Amazon declined to comment. ■ It used to be that only a few cranks criticized Amazon, but that is rapidly shifting. Still, I was surprised at the take-no-prisoners tone of David Heinemeier Hansson, the programmer who writes and tweets as DHH, in an open letter to Jeff Bezos, Amazon’s founder, on Medium. ■ One last new Amazon development, which might be the biggest of all: unionization. Workers at Amazon’s biggest warehouse in Spain began a two-day strike on Thursday. Warehouse employees on Staten Island are calling for unionization, following the lead of colleagues in Minnesota. Here is a good wrap-up from the Guardian. Amazon has successfully stymied unionization efforts since the company began, so this shift is momentous.